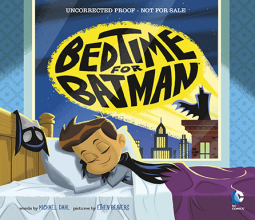 Fantastic bedtime story for superheroes' fans! Every activity in the boy's bedtime routine is told in the a comic fashion. Batman gets the signal: dad points at the clock; Batman gets ready for the action: the boy wears his pajamas. Batman locks away the villains, the boy puts away his toys. I found this book cute and original. The illustrations are colorful, and the layout allows to follow both stories, Batman's and boy's, in a perfect way. And very important: Batman pictures are faithful to the original. Nobody would like a Batman who doesn't look like a Batman!